Here's a sailing story to end 2006 on a high note...according to this feature in the Daily Mail, 14-year old Michael Perham is set to become the youngest person to sail solo across the Atlantic Ocean. 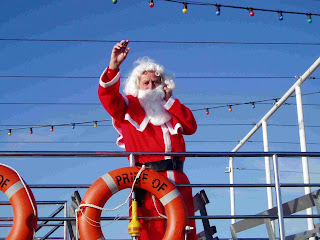 Though Michael's father, Peter, 47, a chartered surveyor and experienced yachtsman, is following two miles behind his son and keeping in regular radio contact...the boy has handled everything that's come his way from fierce line squalls to the doldrums and a Christmas holiday spent floating in the open ocean alone. The teenager, from land-locked Potters Bar, Hertfordshire, set off from Gibraltar on the 3,500-mile voyage to the Caribbean on November 18 aboard the 28-ft yacht, Cheeky Monkey. He hopes to reach Antigua, and break the world record for the youngest unaided sailor across the ocean, on New Years Day. The Sydney-Hobart offshore race was certainly true to her nature...within 48 hours of the start two yachts have dismasted (Maximus and ABN Amro One), six crew members were injured and a total of eight boats were forced to retire. 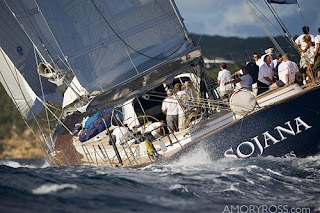 The official Rolex site for the race is carrying news of a Wild Oats victory. Declares the latest update...the Australian maxi Wild Oats XI has taken back-to-back line honours wins in the Rolex Sydney Hobart Yacht Race, the first since 1964 and only the sixth time in the event’s 62 year history. Wild Oats XI, owned by Bob Oatley and skippered by Mark Richards, crossed the finish line of the 628 nautical mile race at Hobart’s Castray Esplanade at 9:52pm tonight giving her an elapsed time of 2 days 8 hours 52 minutes and 33 seconds. Navigator Adrienne Cahalan said that a crucial decision early in the race was whether to go offshore to pick up the current and stronger winds or stay closer to the coast where the seas were flatter but potentially there was less wind. “We opted to go inshore and stay out of the current which meant staying out of the big waves and just looking after the boat for the first night. That’s what we did and it paid dividends." 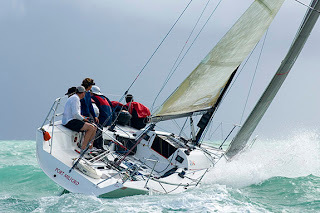 Sailing, like any sport that involves exposure to the elements, can be hazardous to your health. We routinely hear stories of people being washed overboard by waves, hit in the head with a boom, threatened by sharks, struck by lightning, run over by the dinghy...so this story in the Aussie Age should provide a bit of levity in what otherwise is a grim review of the dangers at sea. According to the article, ICHI Ban skipper Matt Allen was smacked in the face by a flying fish during last year's Rolex Trophy Series. And by the way, sunfish, which can weigh up to 5000 pounds will cause serious damage...collisions are common. Said Allen, "All of a sudden, I was just laid flat on the deck. I didn't see anything coming at me...I opened my eyes and there was this enormous flying fish. It had jumped straight out of the water and hit me. There was blood everywhere but fortunately most of it was his." As we head into the holiday weekend it's true that - in the sailing world - not everyone will be hanging their stockings with care above a crackling yule fire. At one extreme you have my Caribbean cruising parents who have made Antigua recently after a long slog upwind from St. Maarten. They're currently anchored in Falmouth Harbor with plans to move to the yacht basin at the Mill Reef Club later today. Not feeling sorry for them. Then at the other end we have the professional offshore racing sailors readying themselves for next week's Sydney to Hobart race. According to this article the weather report for the start is grim, with strong southerlies for the first few days of the race predicted. So if you're in my neck of the wood (Northeastern U.S.) and find yourself longing for a still distant 2007 sailing season try not to envy my folks (and their ilk)...and be glad you're not dogging the cold, nasty midnight watch aboard ABN-AMRO. Here's a jump to an article in the Portsmouth Herald written by a "boat carpenter" who trained for the trade expecting, "...hand tools with sharp blades and materials like bronze, leather, canvas, and sweat." As anyone who has spent even a little time in a modern boatyard knows, these days you're most likely to, as the author puts it, spend your time, "staggering around wearing sticky rubber gloves and disposable body-suits with a respirator..." The old expectation vs. reality equation - an equal opportunity cliche but one that dovetails with sailing quite nicely. The newly arrived yacht owner who expected leisurely daysails to quiet, pristine coves for undisturbed picnic lunches. His inaugural cruise turns into a nail biting, soak of a windward beat to a rocky anchorage crowded with obnoxious power boaters. The cooler shipped sea water and they ate soggy sandos and sipped bottled water in a cloud of diesel fuel. The anchor? Stuck on the bottom. 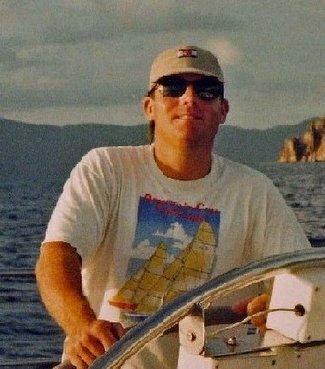 The young 20-something kid who in 1994 signed aboard to be yacht charter crew expecting huge tips, nonstop sailing, swooning stewardesses and adventure in the Leeward Islands. Remind me to give you the reality check one of these days. I could (should) write a book! I was chatting with my new friend RJ Kikuchiyo the other day as he was helping me fix seams on my house at "The Dunes" and mentioned the sad news of Laura Gainey's death by rougue wave. He knows a couple of the crew currently aboard the tall ship Picton Castle and, as well, is a fan of the barques home port Lunenburg, in Nova Scotia, Canada. I've heard of Lunenburg in passing... but RJ spoke highly of it so I decided to do some research. Surrounded by water, the coastal village is nestled between Lunenburg "Front" and "Back" Harbours, on a steep hillside facing south. The town was founded by German, English, French and Swiss immigrant farmers who, it is said, through necessity, time and determination became some of the world's finest seamen and shipbuilders. Picton Castle is part of a robust tall ship fleet based out of Lunenburg - which includes a replica of Canada's most famous tall ship, Bluenose - the Bluenose II. I've posted on rougue waves before though despite logging thousands of offshore miles I've yet to encounter one...unfortunate news crossed the wire this weekend concerning 25-year-old Canadian native Laura Gainey, who was swept off the tall ship Picton Castle this past Friday night - she was on the aft deck when they were slammed by a 25 foot plus wave roughly 475 miles southeast of Cape Cod, MA. Last word is that the U.S. Coast Guard has called off the search - estimating she would be able to survive about 36 hours, based on factors including her age, her physical fitness and the water temperature of 22C. According to reports, the ship has circumnavigated the globe four times. The crew of 29 consists of 10 professional sailors and 19 unpaid trainees who sign on to gain sailing experience. Laura was the lead seaman in charge of trainees on her watch during the current voyage. Who hasn't peered into the dark swirling water rushing past on a midnight watch and wondered, with a shiver, what it would be like to be watching the dim lights of your boat recede, leaving you to contemplate the horrifying prospect of discovering exactly how long you can tread water. God rest the soul of Laura Gainey. It was 19 degrees above zero when I got in my car to go to work this AM. Unlike some of my sailing blogger colleagues, I'm not really into frost biting. All those years in the Caribbean must have thinned the blood. But luckily the weather is always fine in SL...here's a bird's eye view of my new ocean front estate on the East End in the New England sim...I've nicknamed it "The Dunes" in honor of Gerald and Sara Murphy's Hamptons retreat of old. Want to read more about the brains behind this beautiful land/seascape? Then check out an interview with co-founder Barb Carson. Barb and with her partner Montecore Babcock (with the help of designer/builder RJ Kikuchiyo) have created a virtual sailing haven par excellence! Living well is the best revenge. I've written about the "SkySail" over the past year or so - at time with skeptisim, it's true. I believe at one point I had a comment posted from one of the executives insisting that it was real, yes, actual oceangoing freighters would employ what amounts to a giant spinnaker. And it seems that it has or will shortly come to pass...here's an account in The Scotsman that opines, "After four years of tests, it is anything but a pie-in-the-sky project." Maybe so. But the natural questions is, what happens in a broach? When I moved to St. Thomas U.S.V.I. in the mid 1990's with the intent of being crew-for-hire in pursuit of my U.S. Coast Guard Captain's license, my first job was barback for a now long gone outfit called "Schooners Landing" at the former Ramada Yacht Haven Marina in Charlotte Amalie. It was a good vantage with which to infiltrate the local boatie community and, as well, made me instantly part of a large and boisterous group of young people who lived on the boats in the harbour and worked either in food service or for one of the small businesses in the marina. 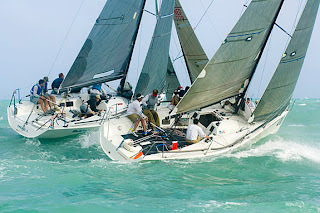 I shortly graduated from barback to waiter/bartender and after a few months landed my first sailing job as crew for day charter sailing boats. The captains of these boats were all liveaboards with yachts shipshape enough to entertain and the desire to make a little money from the cruise ship company for the privilege taking their cruise passengers out for four hours of sailing and a quick snorkle. In the nearly a year I served as mate on a number of these boats I'm happy to say we never had a problem or an accident - though I did have one fat, balding hairy guy throw a panic attack on the snorkle and nearly drown me. I felt very thankful to have never been aboard for a disaster when I read this story on a mast on a commercial tour catamaran off Waikiki snapping and pinning a passenger between the top deck and the cabin this past Friday. Tragically, a teenage boy was killed and two women badly injured. It's a reminder that the potential for injury and death aboard boats is very real - even when the sun is shining and the wind is light.